When people talk about disruption they often ignore that there is more than one type. You have the highly unpredictable form of product vs product substitution (e.g. Apple vs RIM) and then you have the highly predictable form such as product to utility substitution (e.g. Cloud). Confusing the two forms leads to very public arguments that disruption isn't predictable (Lepore) versus disruption is predictable (Christensen) - see New York Times, The Disruption Machine. The answer to this is of course that they are both right, both can give examples to support their case and at the same time they're both wrong. If you mix the two forms of disruption then you can always make a case that disruption appears to be both highly unpredictable and predictable. The second common mistake that I see is people confusing diffusion with evolution. The two are not the same and when it comes to 'crossing the chasm' then in the evolution of any single act there are many chasms to cross. The third common mistake is to confuse commoditisation with commodification. This is such a basic error that it surprises me that it happens in this day and age. Still, it does. The fourth common mistake is the abuse of the term innovation. This is so widespread that it doesn't surprise me many companies have little to no situational awareness and that magic thinking abounds. If you can't even distinguish this most basic of concepts into the various forms then you have little to no hope of understanding change. Once you start mapping out environments then you quickly start to discover a vast array of common and repeatable patterns from componentisation to peace / war & wonder to the use of ecosystems. There's a vast array of tactical & strategic gameplay which is possible once you know the basics and contrary to popular belief, even changes in company age and the processes of how companies evolve are not in the realm of the mysterious & arcane. I've used this stuff for a decade to considerable effect from private companies to Governments. The fifth common mistake is pace. I recently posted a tongue in cheek pattern of how things change. I like to use a bit of humour to point to something with a bit of truth. 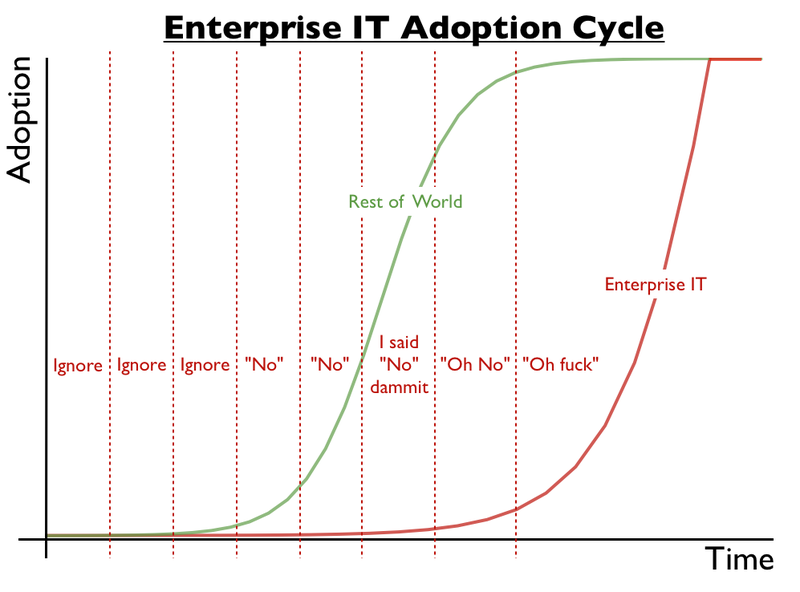 In the same way, I used my enterprise adoption graph to provide a bit of humour pointing to the issue of inertia. 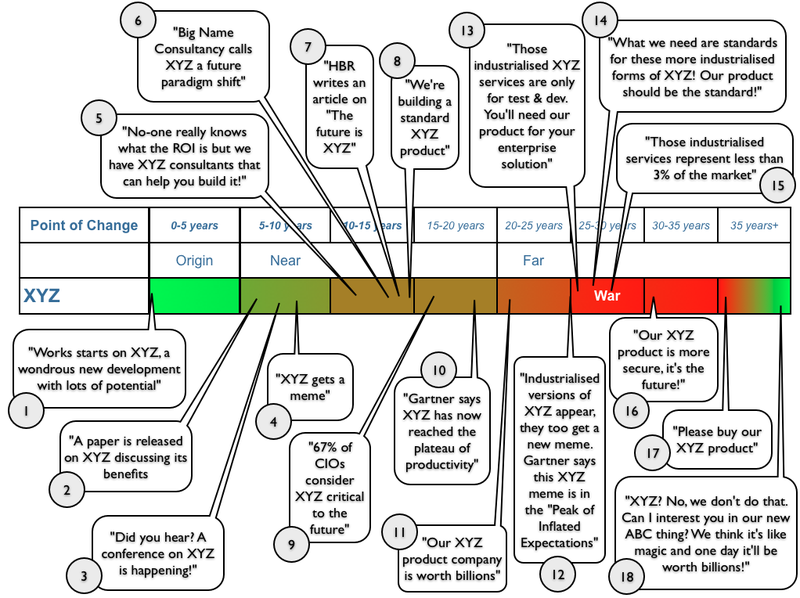 However, whilst most people half heartedly agreed with elements of the pattern of change (just like they agreed with Enterprise Adoption Curve), there was equally disagreement with the timeline. The majority felt that the timeline was too long. People often forget that concepts can start a long time ago, e.g. contrary to popular ideas, 3D printing started in 1967. The problem is that we are currently undergoing many points of "war" within IT as an array of activities move from product to utility services. Whilst these "wars" are predictable to a greater degree, they are also highly disruptive to past industries. Multiple overlapping "wars" can give us a feeling that the pace of change is rapid. I need to be clear, that I'm not saying the underlying rate of change is constant. The underlying rate of change does accelerate due to industrialisation (i.e. commoditisation) of the means of communication (see postage stamp, printing press, telephone, internet). 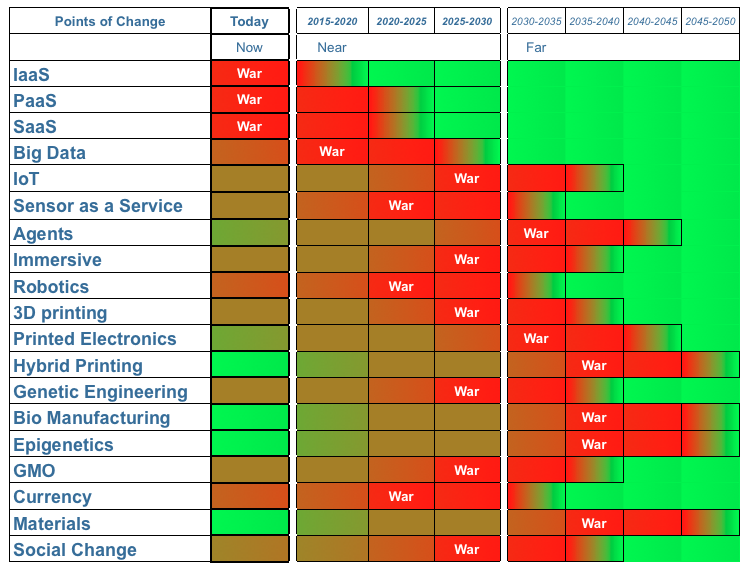 BUT it's too easy to view overlapping "wars" as some signal that the pace of change itself is much faster than it is. It still takes about 30-50 years for something to evolve from genesis to the point of industrialisation, though a speculative case can be made that this accelerated post internet to about 20-30 years with 10-15 years for the 'war' to disrupt the past. We don't have enough data to be sure at the moment hence the importance of weak signals in determining when the 'war' will start. However, come 2025-2030 with many overlapping wars (from IoT to Sensors as a Service to Immersive to Robotics to 3D printing to Genetics to Currency) then it'll feel way faster than that and way faster than it is today.